Grandma's old fashioned vanilla ice cream recipes call for all-natural ingredients so you can be sure your homemade ice cream will taste extremely good AND be good for you too. 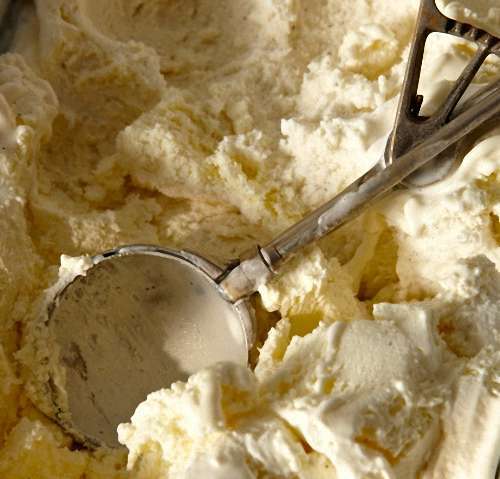 Countless polls show that vanilla is still the world's favorite flavor for ice cream. Folks never seem to grow tired of eating it. Make yourself an old fashioned treat today! Typical of pioneer recipes, this is one of the easiest and most inexpensive vanilla custard ice creams to make, calling for whole milk instead of cream, and it yields a delicious frozen dessert. Ingredients: 6 cups of milk; 4 eggs, whites and yolks separated; 3/4 cup of sugar, 2 small teaspoons vanilla, 2 tablespoons of cornstarch, a little salt. Method: Heat milk. Mix egg yolks and add sugar, mix cornstarch to sugar and egg, then add to hot milk, then add salt and flavoring, add beat egg whites last. Freeze. This makes a freezer full. 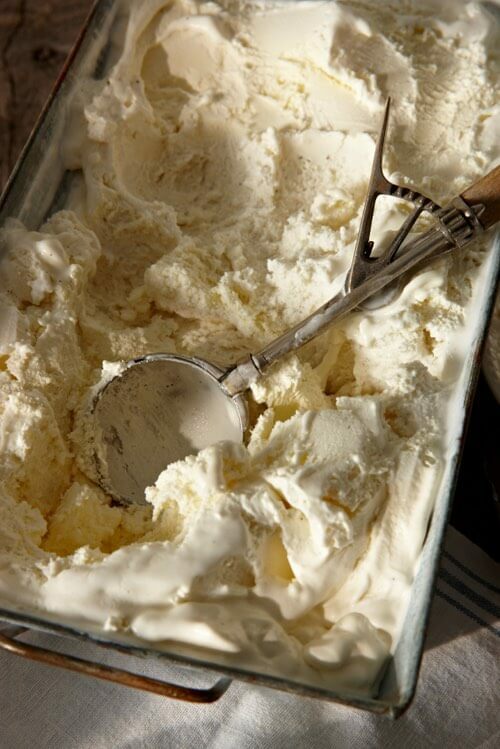 The version calling for vanilla sugar is similar to the traditional French vanilla bean ice cream recipes that have been popular since the 17th century. After you sample this elegant blend of rich cream and homemade vanilla sugar, the store-bought variety will seem very ordinary to your taste. Philadelphia is a name generally applied in America to all ice creams made with pure cream and no eggs. Ingredients: One quart cream, 1 scant cup sugar, flavor to taste. Mix the sugar and flavoring with the cream, and when the sugar is dissolved strain it into the freezer. This is the quickest and easiest method; the cream increases in bulk considerably and is of a light snowy texture. Whip the cream until you have taken off a quart of the froth, mix the sugar and flavoring with the unwhipped cream, strain into the freezer, and when partly frozen add the whipped cream and freeze again until stiff. This gives a very light delicate texture to the cream. Heat the cream in a double boiler until scalding hot, melt the sugar in it, and when cold add the flavoring. This is considered by many the best method, as the cream has a rich body and flavor, and a peculiarly smooth, velvety appearance. It also prevents the cream from turning sour. The cream may be whipped first, and the froth removed until you have a pint, then scald the remainder of the cream with sugar, and when cold add the whipped cream. The simplest way is just before freezing flavor with 1 or 2 tablespoonfuls of the extract of vanilla; the amount will depend on the strength and purity of the extract. Use 1/4 less than the sugar given in the basic Philadelphia vanilla ice cream recipe; just before freezing add from 1 to 2 tablespoonfuls of "vanilla sugar" (see below), or enough to give the flavor desired. Split 1 ounce Mexican vanilla beans, remove the fine seeds and soft part; put them in a mortar with 1/2 pound sugar and bruise them till the seeds are separated and thoroughly mixed with the flour; sift through a fine strainer, letting all the fine seeds go through with the sugar; cut the outer part of the bean into small pieces, bruise with another 1/2 lb of sugar; sift and pound again until all is fine. The sugar that has the seeds may be kept for French vanilla ice cream recipes, as the presence of the seeds is very desirable in genuine vanilla bean ice cream. The second portion may be used for flavoring custards, etc. Whether you're wanting an electric ice cream maker recipe, or you choose to make ice cream in your refrigerator freezer, or in an old fashioned churn, the above recipes will adapt to help you make a deliciously smooth and flavorful frozen dessert that'll leave you begging for more. Enjoy experimenting with these old fashioned vanilla ice cream recipes. Frozen custard desserts are easy to make, and everybody loves the homemade taste. When it comes to rich-tasting ice cream, you can't beat homemade!